The mild, smooth flavor of Luzianne® Iced Green Tea is the perfect base for all kinds of iced tea, summer punches and healthy, superfood smoothies. Read on to learn some of our favorite ideas for flavoring and preparing green tea drinks, plus instructions for fresh-brewing a big pitcher of Iced Green Tea to keep handy in the fridge. 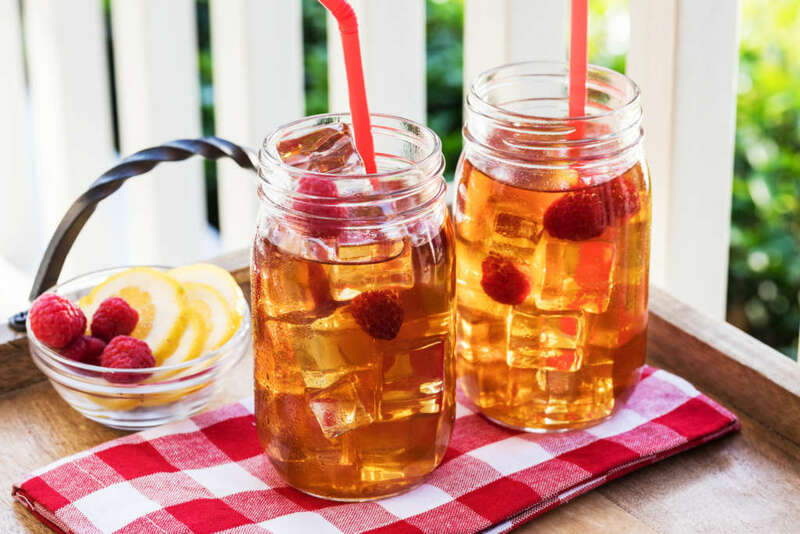 Fruit Infusions: Add fresh-muddled, chopped or frozen berries to sweetened green tea, allow to steep for about 20 minutes, then strain out the fruit solids and serve over ice. Super Smoothies: Blend your favorite berries with green tea and yogurt, honey or sugar and a frozen banana. Add a handful of greens to make it more super. Fruity Tea: Add fresh squeezed lemon, orange or lime juice to green tea. Lemon Berry Tea: Pair green tea with lemon juice and cranberry juice or pureed, strained raspberries. Mint Tea: Add fresh-muddled mint leaves to sweetened, room-temperature green tea; serve over ice. Ginger Tea: Steep a piece of ginger root in green tea; strain out the ginger, sweeten with honey (or a sweet juice like pineapple or orange) and serve over ice. Lemongrass: Steep in hot green tea, sweeten and serve over ice for a fragrant, lemony iced tea; also pairs well with ginger. Herbs such as ginger and lemongrass release their full flavor when infused in hot water. Other herbs, such as mint, can be crushed (with your hands or in a mortar and pestle) to release their flavor essence, and then infused in cold water. 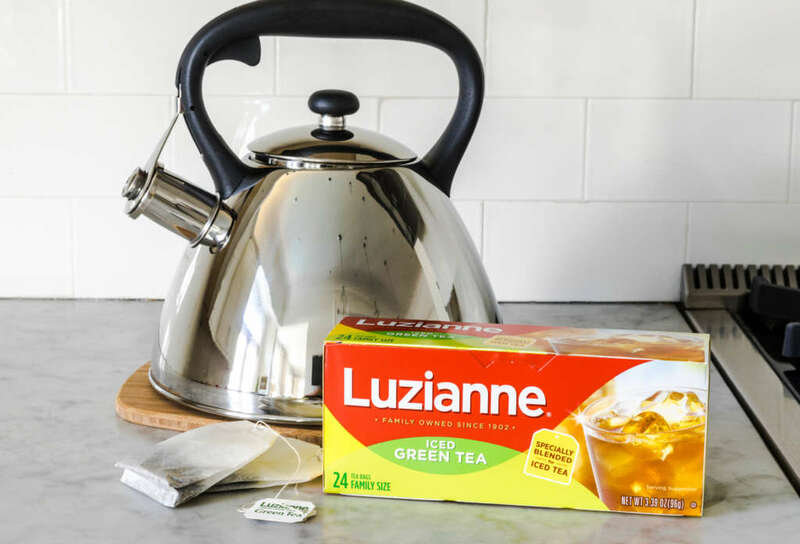 To make a large pitcher of green tea, boil 2 quarts (8 cups) of water, remove from heat and drop in 2 Family Size Luzianne® Iced Green Tea bags. Brew 3-5 minutes and sweeten* to taste, if desired. Transfer to pitcher; place in fridge and enjoy throughout the week. Fill a clean, clear glass container with 2 quarts (8 cups) of water, add 2 Luzianne® Family Size Iced Green Tea bags. Place a cap or cover loosely on the container and place it in direct sunlight to steep for 3-4 hours (do not exceed 4 hours). Remove tea bags and sweeten* to taste, if desired, before refrigerating. 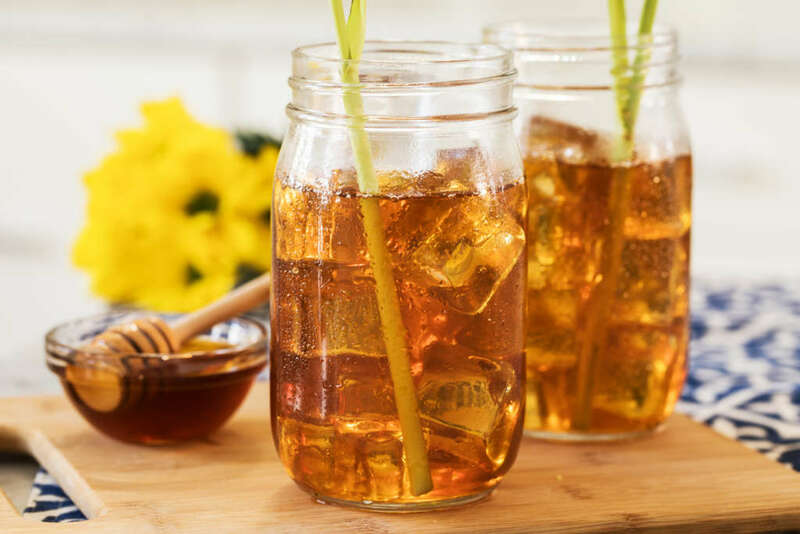 *Liquid sweeteners are the best way to sweeten cold tea. To make 1 cup of simple syrup, combine 1 cup sugar and 1 cup water in a saucepot over high heat. Stir. Bring mixture to a boil; cook and stir until sugar is dissolved, about 90 seconds. Place in refrigerator to cool. Pour into a squeeze bottle for use.